This was the end of ABBA! Though no one knew it at the time. 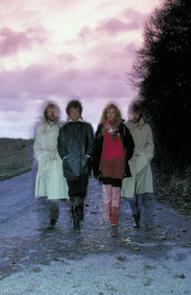 ABBA's breakup was never announced, they simply never recorded again after this album. There were clues that ABBA was coming to an end-notably the solo albums by the girls, and word of the nascent CHESS musical...This collection of most of ABBA's A- sides was put together when it became clear that the group had no enthusiasm and not enough songs for an entire 1982 studio album of new material. This "lack of enthusiasm" meant that the six new B&B compositions that were recorded got treated rather badly. Only two of the six songs ("The Day Before You Came" and "Under Attack") made it onto THE SINGLES 2LP collection. These two new songs were released along with the 21 previously released A-sides from 1972-1982. These two songs were also released as the A sides of ABBA last two singles . "The Day Before You Came" and "Under Attack' were the songs chosen to be A-sides. Neither of the A-sides would do well in most places. Neither song hit the the Top 10 in Britain. Neither song even hit the Top 100 in America. 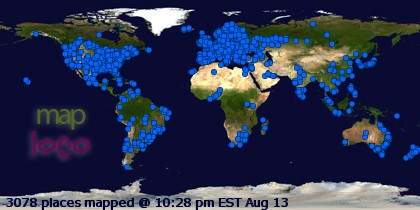 However, one territory remained loyal-I the Netherlands There TDBYC went to #1. The Low Countries showed once again that have ABBA's most consistent fans. Two more of the six songs, "Cassandra" and " You Owe Me One" were initially released only as B-sides and were left off THE SINGLES collection. Dumping quality songs onto B-sides was a habit ABBA only got into during the latter part of their career. Between late 1973 and mid 1979 B&B only dumped one of their non -LP English language songs onto ABBA b-sides( "Crazy World") But Five non-Lp B&B songs showed up on their post mid 1979 singles. The A&B side tracks would later be available on the BOX set and on other albums, and CD's. MORE ABBA GOLD, for example, has three of the four tracks. The 2001 remastered version of THE VISITORS is now the official home for the two A-sides as well as "Cassandra ". "You Owe Me One" had been on the prior remastered versions of THE VISITORS. ".. The songs on the 1982 sessions would be dubbed the Opus 10 sessions by a Swedish journalist even though ABBA never had a working album title. 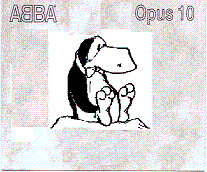 Supposedly,according to this journalist Opus 10 would have been ABBA's 10th album up to that time but, in actuality, it would have been ABBA's ninth studio album . It would be the tenth if only if you count ABBA's Spanish album Gracias Por La Musica, but their twelfth if you include their two Greatest Hits albums, and if you exclude RING RING which was not released in most places you get different numbers all together! 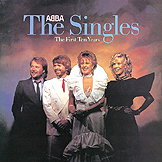 THE SINGLES -THE FIRST TEN YEARS would be phased out from the catalogue when ABBA Gold was released. It also showed up temporarily on the first Remasters of THE VISITORS from the late 1990's but not was retained on the 2001 remaster...It can be found on the box set. "I am the City" was a fine techno-pop song that finally surfaced in 1993 on MORE ABBA Gold. " It's Hard to see why ABBA did not release back in the 1982 although it has been rumoured that it was being saved for a possible post-Chess ABBA album. The holy grail of unreleased ABBA songs, since this song is perhaps the best completed ABBA song not to see a full uncut release . There were at least two versions of JLT. One version-the "La La" version of "Just Like That' is similiar to the later "Day Before You Came" -it features Agnetha's singing about yet another neglected woman, this version has a busy but laidback synthesizer arrangment. Another version is the peppier mix found in an abridged version on ABBA's boxset. This version features Raphael Ravenscroft on sax-and sounds more like hit single material, but B&B were unable a produce a mix that they were comfortable with .And so all the versions remained in the vault in 1982. B&B would only allow a small snippet of "JLT" to be released on the 1994 box set.. The main reason given that ABBA's version of "JLT" has not been fully released is that B&B regard their 1985 production of a version of JLT by Gemini to be definitive (SEE GEMINI section.). Ironically, the Gemini version is out of print, anyway! The melody was borrowed again for use on a song in the 2002 Swedish language version of Chess. Originally just a b-side. "Cassandra" features a intriguing lyric and a rich production. "Cassandra's "packing your bags" section (at 2;15) is one of the best 5 seconds in the ABBA ouvre. (even if the swelled voices effect was originally used by the Beach Boys ) Some of the arrangement of the song is borrowed from the then unreleased 1980 ABBA recording-"Put On Your White Sombrero". To be honest, the song hasn't aged well for me...I loved this song at first-"the oh this is a cool b-side effect" But it's not a great song-just a very good one.. "Cassandra first showed up on some of the ABBA "love song" LP collections of 1983,but didnt really make it onto a wide release on CD till MORE ABBA Gold was released. It can now be found on THE VISITORS remaster and on the box set. ABBA's last original single and the second A-side, pulled from "THE SINGLES' "Under Attack" ,was actually a fairly good pop song -but the world was cooling on ABBA . The video for "Under Attack" is ominous, at the end the four members walk away grimly with their backs to the camera. Ominous, since this was the last ABBA video. "Under Attack" was ABBA's last original single. It is a surprisingly peppy number for a swan song. But it was one ABBA's least successful singles. "Under Attack"can now be found on THE VISITORS remaster and on the box set. Supposedly ,The French split this album up into two parts...I have never seen this version..
For best results, give them plenty of sun, frequent watering, and regular fertilization. More ABBA Gold but obviously a different song lineup . The original version of this had liner notes by UK ABBA press officerJohn Tobler, but the recent remastered editions has liner notes by Carl Magnus Palm. A recent Australian ressissue of this CD bizarrely throws out "Cassandra" and "Lovelight". This CD has gone out of print in most places. ABBA- Thank You For The Music 4cd set 1994 Available worldwide. THE BOX SET HAS FIVE OF THE SIX 1982 Tracks, but "JUST LIKE THAT' " is in a edited version. This long awaited box set (or in actuality booklet set) was released after ABBA GOLD proved that were still a handful people (not many mind you, just a lucky few) willing to spend money on ABBA records. B&B ,( who always seem disdainful of their fans wishes) were skeptical that any one would want to buy a ABBA box set. More significantly, B&B were hesitant to release previously unreleased material. However, a trip to the vaults reminded them that many of the unreleased songs merited official release. So miraculously somebody was able to convince B&B to put out a box set. into one big smorgasbord. About half of ABBA's official output was compiled in this box set.-66 tracks on four Cd's. respect. Most of the B-sides can be found on thebox. They are spread throughout all four CD's. most of the songs are chock full of great ABBA hooks. So,It is not illogical to put unfinished songs in a medley format. Probably the best tune on the medley is the lovely "Hamlet III", which is featured in two versions. an accordion tune called "Lottis Schottis". At least two songs featured in "ABBA Undeleted", "Just A Notion" and "Just Like That" don't seem to benefit from being put in the medley-they are too truncated compared to the unreleased versions. It's obvious listening to bootleg versions that B&B were having problems with "Just Like That" ,they tried different approaches to the song-and all were good but none was just right. The version of JLT on the box set is a just snippet of a longer Sax version. The full length Sax version doesn't seem to develop the full potential of the song. The slower versions seem to make more sense but they lack the "hit single energy" of the sax version. indexed on the CD , so it's hard to get to a particular song if want to listen to that song repeatedly. the group was called ABBA. The liner notes to the box set are lengthyand include essays by USA Billboard editor ,Fred Bronson and British ABBA publicist John Tobler. ABBA memorabilia is pictured and some of Björn's latterday original handwritten lyrics are reproduced.The best part of the liner notes is Carl Magnus Palm's song commentary. far worse.The box set was compiled by Chris Griffin,and remastered by Michael B. Tretow. The photograph on the cover was originally used on the Voulez-Vouz Angeleyes single. You can find 3 of the 6 1982 tracks on the new remastering of the 1981 album ,THE VISITORS. Lars Larsson's photo on the cover is slightly different than the original cover. Apparently, Universal had trouble finding the exact original negative. Features new liner notes by Carl Magnus Palm and four bonus tracks. "Cassandra" replaces ""You Owe Me One' as a bonus track. "Cassandra " had been inexplicably left off the original 1998 remastering of this album .It's Not clear, why we can't have both tracks. Hey and throw in" I am the City" and "Just Like That "as well. Hell why not just make a separate CD for the six 1982 tracks. The photo on the cover is slightly different than the original cover. In 1983/84 B&B did a few demos for their CHESS project. One song recorded was "Every Good Man" which features Agnetha singing Björn's dummy lyrics to what would become the melody of "Heaven Help Heart'. The "Every Good Man' demo proves not surprisingly that Agnetha would have had no problem playing the Florence role in CHESS. "Every Good Man" is usually categorized as a ABBA song by bootlegers but strictly speaking it is not. Also,three highly different variations of the" "Just Like That" melody were recorded by Elaine Paige, Tommy Korborg and Benny alone doing an instrumental version. These alternatives were called "When The Waves Roll out to Sea" and "When the Stars Are Up in The sky". Supposedly there are several other interesting unreleased Chess demo recordings, most of which have never been heard outside of Polar Studios. It is also interesting to note that 3 of the CHESS songs had their melodic roots in unreleased ABBA tracks. " I know Him So Well" has bits from" I Am a A". Secondly, Anthem" comes from "Nationalsang". Finally, parts of "Someone Else's Story" comes from "Lady Bird". Sine their breakup in 1983. ABBA has never recorded together or done a live concert in front of paying audience, there have however, been a few get-togethers of a limited nature. The only public reunion of ABBA was for the taping of a performance by ABBA of Stig Anderson's song "TIVIDSHAMBO' for a Swedish TV special on January 16, 1986 . The performance features Benny on accordion, Bjorn on guitar and the ABBA members singing lead together in a somewhat rough fashion. The roughness of the recording probably explains why this has never been released officially even though this is ABBA's last public singing appearance together. The recording is available only on bootleg.. Nobody would have guessed that this was to be ABBA's final performance...The Palm/Hanser book -From Abba to Mamma Mia describes the taping as having been a bittersweet occasion. Abba actually had another little known private reunion during February? 1986 at the 40th birthday party for their friend Claes af Geijerstam.. Claes' birthday is in February so I assume the party was around that time...They supposedly sang the obscure unreleased Chess song-"Der Kleine Franz". Chess premiere London -Bjorn and Benny only attended. Chess premiere Broadway- Bjorn and Benny only attended. Only three members of ABBA attended manager Stig Anderson's Funeral in 1997. Agnetha did not attend, she was sick-a bit of a cough, I think..
All four members of ABBA showed up in the one place at the same time as ABBA tour manager Thomas Johansson had his 50th birthday. Björn, Benny and Frida sang "With A Little Help From My Friends". Frida sang "Shine On You" . No bootleggers were present. Bjorn and Benny only attended. A,B,B & F were in the same room for ABBA manager -Gorel Hanser's 50th private birthday party in 1999. At the party for Mrs. Hanser A,B,B & F sang a old standard called "Med En Enkel Tulipan' (With a Single Tulip). 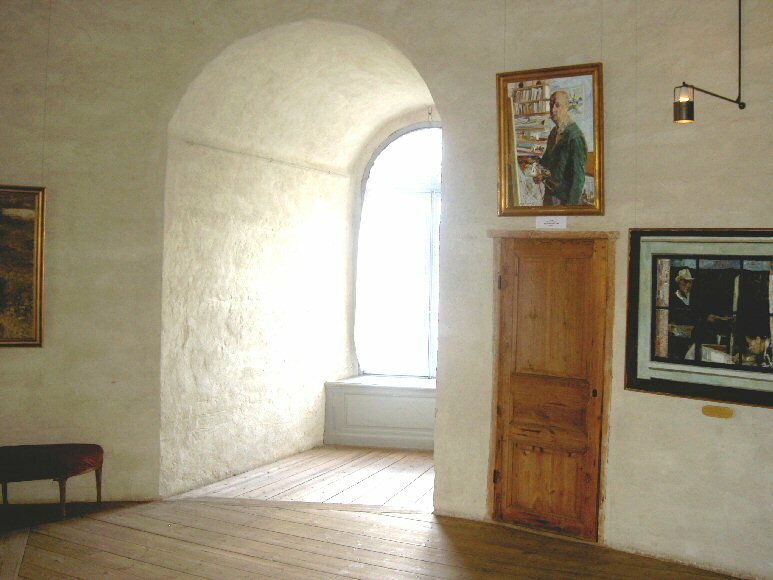 B&B also wrote a minor tribute to Gorel called Briggens Blåögda Blonde Kapten which was performed by a choir,. The song title when translated from the Swedish to English would be called "Briggens' Blue eyed Captain" . As far, as we know neither song was recorded for the benefit of bootleggers. 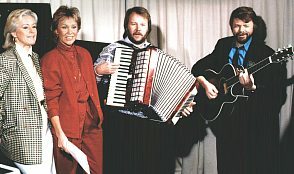 The second song however can be found in an instrumental studio version on the first album by Benny Andersson's Orkester. In early February 2000 it was disclosed that ABBA had received at least one offer, possibly multiple offers to reunite for a concert tour...The exact offer or offers were never clearly spelled out-the Swedish press said the group were offered One billion krona, the international press said it was one billion dollars....Some reports said the consortium was a British-American, other reports said they were Japanese. Some of the reports said the promoters wanted ABBA to perform 100 concerts... In any case, the former members of ABBA declined continued to decline all offers to reunite, after all, they never enjoyed touring,three of the four members don't perform in public anymore and they didn't need the money..
Only Bjorn and Benny attended the broadway premeire of Mamma Mia..
All four members of ABBA agreed to appear briefly and separately in a short but clever and entertaining video clip broadcast during the 2004 Eurovision song contest...It originally been hoped that the four members might agree to make a non-singing appearance together, but instead this near reunion was agreed to....Of course, all four members had also appeared separately in interviews for The Winner Takes It All (1999) and Super Trouper (2004) documentaries. The cover for "The Singles-The First Ten Years"
Picture from "Under Attack" sleeve photo sessions..
Never used cover idea for ABBA's last album!